This document of the Rules on Search Results Ranking onwww.alibaba.com(Supplier’s Edition) describes the algorithm for managing search results ranking onwww.alibaba.com(hereinafter called “Alibaba.com”), and is edited and first published by Alibaba (China) Technology Co., Ltd.(hereinafter called “Alibaba”) on September 2014. This document targets at providing guidelines and assistance to supplier members over Alibaba.com. It should be noted that the search results ranking on Alibaba.com is continuously being updated according to user’s needs, business environment and statutory regulations. Ranking of search results may vary from time to time due to dependency of numerous variables. Therefore, the examples illustrated in this document are for reference only and shall not be regarded in any way as an undertaking. Search function is vital to websites and enables users to quickly retrieve what they want. Ranking is the way how results are displayed. Alibaba.com endeavors to enable users to search for the most suitable products, suppliers or information through the function of search results ranking. Alibaba.com currently supports searching results ranking in terms of categories, products, suppliers and products within a particular mini-site. The algorithms of these types of ranking methods are generally similar – All of them are comprehensively sorted and only differ in minor areas. 1. Buyers-oriented: The algorithms are buyers-oriented and they favor products or supplier that buyers need, because the searching functions are mostly used by buyers. Suppliers’ information that match buyers’ needs or interests are promoted and would facilitate suppliers to have their products effectively displayed. 2. Deceitful behaviors are harmful to both buyers and business environment. Alibaba.com takes the principle of “strong penalty against deceitful behaviors” into heavy account. Deceitful suppliers shall be subject to strong penalty. Search Results Ranking is buyers-oriented and the algorithm sorts search results from the buyers’ perspective through multiple stages. Take search results ranking by product as example. The algorithm consists of three major stages: trick filtering, matching and sorting. The algorithm filters out deceitful products as the first step, and then select out the products that match what is being searched according to relatedness of product category and that of product descriptions. Finally, search results are sorted according to buyers’ preference, products and suppliers’ maintenance quality. 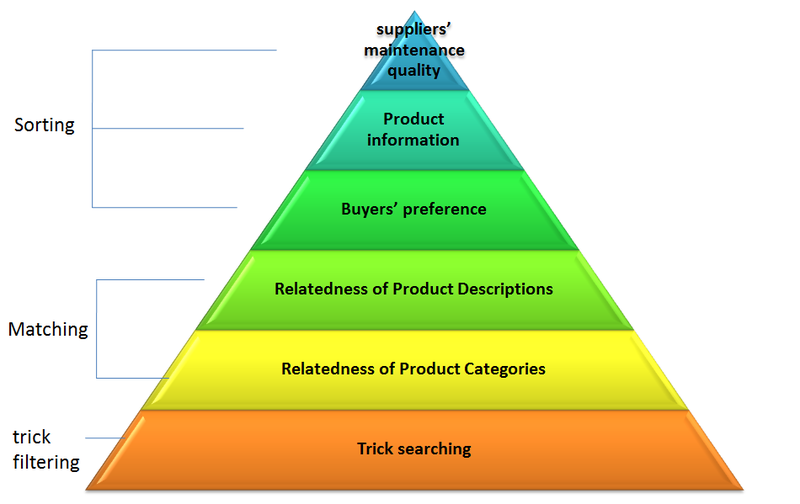 Figure 1 below is the diagram for product ranking process. The search function ensures the product categories are relevant to what is being searched and quickly locates the type of products that buyer searches for. Suppliers are suggested to select the correct and appropriate product categories when listing products. 1） Products posted under incorrect categories are deemed as dishonest behavior, the suppliers of which shall be subject to disciplinary action and the product of theirs shall be lowered in ranking. 2） Products shall not be posted under the “Others” category where an appropriate category is available. Suppliers are encouraged to contact Alibaba customer representative where an appropriate product category cannot be found or where product categories are not set up reasonably. Figures 2 and 3 illustrate the relatedness of product categories. Figure 2: High relatedness between the product image, title, and category. Figure 3: Both the product image and title refer to a clamp, but is posted under the stairs category. This shows a low relatedness to the product category. This product is suggested to be posted under the “stairs accessories” category. Special attention is needed to distinguish the difference in categories between the product itself and accessories of a product. The search function searches for product title, details, keywords for search string and matches them with the relatedness of product descriptions of the search string. 1）Product name should be displayed in the title truly and accurately. Appropriate adjectives or product keywords can be added to the title to increase the chance to be searched by buyers. 2）Product keywords should not be used abusively. Abusively and repeatedly using product keywords would not increase the relatedness of product descriptions but would rather reduce the effect of being searched. Figures 4 and 5 below illustrate relatedness of product descriptions. Figure 4: The search string of the buyer is “12v led lights”. This example shows that correct product details in the title match with the search string and result in high relatedness of product descriptions. Figure 5: The search string of the buyer is “12v led lights”. The phrase “LED Strip” is repeatedly displayed, and reduces the readability and the relatedness of product descriptions. Sorting enables quality products, quality suppliers or buyer’s preferences to be displayed in high priority. The three major factors that affect sorting are buyer’s preference, product information and supplier’s maintenance quality. Higher ranking shall be given to product information that are easily readable, descriptive and consistent. 1） Product titles should be accurate and concise to include product name, model number and details that enable buyers to quickly understand the product. Repeated descriptions with identical or similar wordings are strongly discouraged. Prolonged product titles are difficult to understand and to identify the core meaning. 2）In order to enable buyers to clearly understand the product, product details should be as complete and accurate as possible, while the primary product image should be clearly displayed. 3） Product descriptions must be true and accurate. Conflict or inconsistency with product title should be avoided. Appropriately using image or tables for describing product functions, features, qualities and strengths would enable buyers to quickly understand the product. Moreover, unnatural or seriously repeated product descriptions shall lower the product ranking. Figures 6 and 7 below are good examples of product descriptions. Figure 6: Product details are complete and informative. Figure 7: Product image is used appropriately to describe the product details. Higher ranking shall be given to supplier’s information that are complete and true and to suppliers who have high activity and intensive maintenance over their mini-sites and products. 1）Supplier’s details and authentication details should be provided as much as possible. Generally speaking, the more the supplier’s information are provided, buyers would have the less doubt against the supplier. Less doubt would then lead to less burden on communications with buyers and successful transactions are more likely to happen. 2）Proactive and timely maintenance of mini-site by suppliers, such as controlling listed products to a reasonable quantity, highlighting key products, removing outdated or un-visited products, are strongly encouraged. Buyers would easily get tired by viewing numerous similar or not interesting products posted within a mini-site. Suppliers who have such problem would have their ranking reduced. 3）Timely responses to buyer’s questions can prevent missing out valuable business opportunities, project a positive impression to buyers and help reaching successful transactions. Figures 8 and 9 below illustrate how suppliers display their products differently. Figure 8: Products categories are shown clearly and self-explanatory. Every product has its unique image for buyers to quickly browse what they need. Figure 9: Product categories are not descriptive and hardly understandable. Repeated use of product image would easily reduce buyers’ interest to click further or to keep viewing. The ranking function would identify buyers’ preference and promote what buyers like. 1） Through keeping updated with the relevant industry and being sensitive to buyers’ needs, promote your product strengths and features specifically in product titles, keywords, attributes and descriptions. 2） Buyers’ preference is determined by buyers’ procurement focus. Identical keywords searched by different buyers would result in different products and suppliers results returned because of difference in buyers’ preference and needs. Some suppliers intentionally duplicate products or Miscategorized products under incorrect product categories for deceitfully gaining more chances to be searched. Alibaba searches for these tricks and seriously penalize the violating suppliers. Duplicate products refer to act of abusively duplicating product listings fordeceitfully gaining more chances to be searched. Alibaba specifically prohibits this type of violation (please refer to the corresponding policy at http://rule.alibaba.com/rule/detail/2050.htm). Suppliers are suggested to avoid duplicate products by clearly stating the detailed differences and features of each product in image, title, details and descriptions. Figure 10 below illustrates duplicate listings. Figure 10: This mini-site displays multiple listings of a product with identical image and main descriptions. This is a typical example of duplicate listings. Some suppliers intentionally list products under irrelevant categories fordeceitfully gaining more chances to be searched. Alibaba shall lower the ranking of these products or block them from being searched once identified. Suppliers are reminded to post products under categories in accordance to their nature and correct descriptions for optimizing the chance of products being searched. Figures 11 and 12 illustrate the problem of incorrect categories. Figure 11: Water purifying machine is posted incorrectly under the “Drinking Water” category. Figure 12: Men’s apparel is posted incorrectly under the “Maternity Clothing” category. It should be noted that deceitful acts that affect the search results ranking are not limited to the above. Supplier who is found committing any other deceit or trick shall be subject to disciplinary action. For the ease of suppliers to conduct self checks, a “searching analysis” tool under “My Alibaba” has been implemented to remind suppliers for any violation of duplicate listings and incorrect product categories. Suppliers may follow the instructions for correction. Suppliers are also reminded to be attentive to violations of duplicate listings and incorrect product categories to avoid possible disciplinary action. Alibaba endeavors to uphold a fair business environment and to provide excellent services to suppliers through the users-oriented search result ranking algorithm. Suppliers as stakeholders of the business environment are encouraged to follow what are suggested in this document, to understand the underlying rationale and to facilitate the establishment of trust with buyer and the development of this business ecosystem.